This luxurious plush Christmas stocking is a deep burgundy color with faux fox fur trim. The stocking measures 21" long from the top of the cuff to the toe of the stocking and measures 9" wide along the cuff. PLEASE NOTE The new version as of 2017 of this stocking has thicker fur on the body of the stocking so the embroidery lettering is more difficult to see. 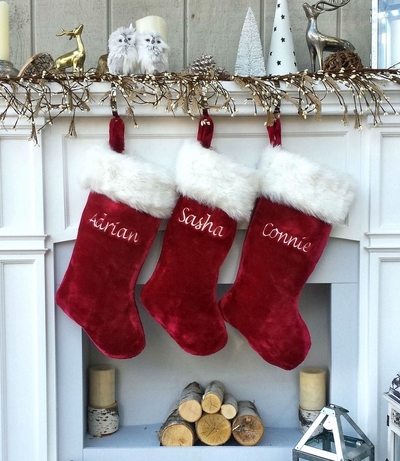 We have increased the size of the lettering on this new version, so the names are up to one inch wider and 1/10th of inch taller - but still - if you are TRYING TO MATCH PAST YEARS ORDERS, THIS STOCKING WILL NOT BE AN EXACT MATCH !